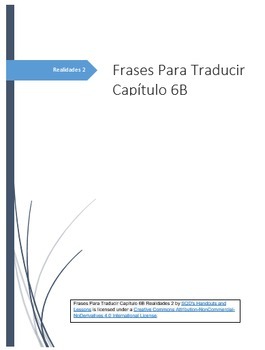 These 20 editable translation sentences correspond to Realidades 2 © 2014 Capítulo 6B. An answer key is included. These sentences are presented in two formats: a Word document and a PowerPoint presentation. I recommend handing out the sentences in English and showing the answer key on a projector when students have finished. If you choose to hand out the Word document and ask students to translate on paper, it's likely that they will need more than 45 minutes to complete all the translations. I try to limit the activity to 45 minutes by assigning a variable number of sentences based on the talent in the classroom. I like to give this as a group work project. It may be appropriate to assign your favorite sentences or divide the class into groups and have each group translate only some of the options so they don't get overwhelmed. 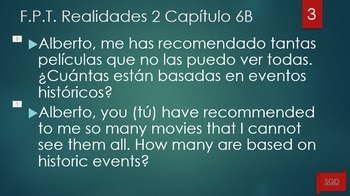 You may also choose to show a question from the PowerPoint and have your students translate out loud as a big group. This method is more efficient, though the trade off is that your students are less likely to pay attention to all the little details the sentences are designed to force them to think through. 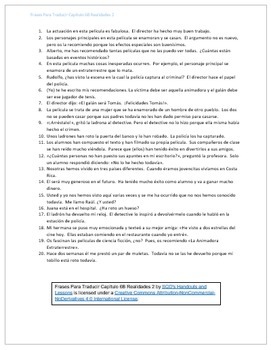 Use these links to access Frases Para Traducir for all chapters of Realidades 2. 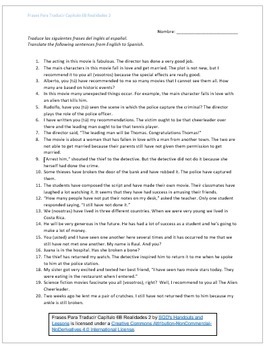 Frases Para Traducir Capítulo 6B Realidades 2 by SQD's Handouts and Lessons is licensed under a Creative Commons Attribution-NonCommercial-NoDerivatives 4.0 International License.